I finally got to celebrate my Blog’s birthday!! A whole year of not much fat-freeness!! Yahoo. Like I mentioned earlier, the first anniversary went by in February, and I had been too swamped to even whip up a simple something. Fat-Free Brainwaves had humble beginnings. My first post was dated February 1st, 2008. It was about fried hotdogs. That’s right. Of all the things I’ve ever made or learnt, one of the first things I tried to cook for my very own party was chopped chicken hot dogs in a flour-egg-oregano batter. My friends had actually looked at me in disbelief when I had announce the blog’s web address to them. A big burst of laughter followed…. Honestly, I didn’t know. All I knew was that I wanted one. What would I put in it? I hadn’t asked myself this question. Back in February 2008, we were in the middle of Final Year Thesis, just recovering from the battering that we undergone from our Thesis Guides and Professors on the presentations of our poorly thought-out design concepts. We had little time to think of anything else, let alone blog, websites and magazines. The only typing we were doing at the time was meant exclusively for our Thesis Books and briefs. And in the middle of all that, setting up a blog seemed like a waste of time and maintaining would have been quite impossible. But I just had to have a place to put up all the photography and design work that I’d done. I had learnt too cook basic meals from Mom…on the phone. So, I decided to add all the my mishaps and haps in the kitchen to the blog, along with design and photography. Its been a whole year (a couple of months more) and I can’t wait to hit the 30,000 visitors mark! 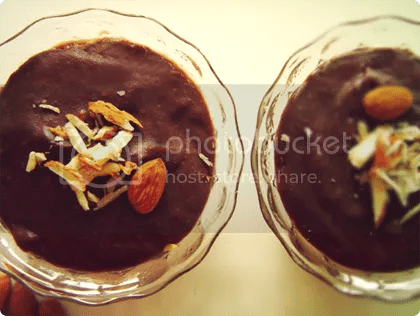 Yesterday, me and Fauri, like true Indians, cooked up a whole deep-bottomed-pot full of phirni. 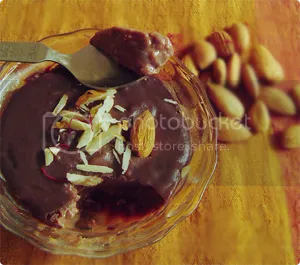 Phirni (firni) is technically a custard made out of reduced milk with sugar and rice flour, stuffed and garnished with dry fruits. Its heavy, sweet oh-so-sweet and you can try out a ton of flavors, if you’re willing to experiment. Phirni, is usually flavored with mava (dry milk), which is something most Indian sweets are made out of. Our version is flavored generously with bittersweet chocolate…..wat else? – Add the rice flour to 1 cup of cold milk and stir well to dissolve, remove all lumps. Keep aside for about 15-30 minutes. – Heat the rest of the milk on low heat. Add the sugar, ground almond, saffron and the rice flour-milk mixture. Stir well. Make sure no lumps exist. – Heat the milk till the mixture thickens into a custard. Coat the back of a spoon with the custard. Run a finger across the back. The custard is done when your finger leaves a clean line across the back. – Stir in the almonds and walnuts. – While the milk is reducing, melt the chocolate pieces with butter in a bain marie. – Stir the chocolate into the custard. Mix well. – Spoon out the custard into ramekins or bowls. – Garnish with slivered almonds, raisins, cashews, etc. – Sprinkle the rose water on the surface of the mixture in each ramekin/bowl. this is best done by dipping your fingers into the rose water and flicking the droplets on the surface. Rose water here is not for flavor, just for aromatic purposes. – Chill in the refrigerator for 3-4 hours, before serving. Congratulations. We bloggers count the months during the first year. After that, we count the years. Wishing you many, many more years of blogging. i’ve almost hit my year mark too! the phirni looks fantastic and super decadent.